Flt.Lt Markel USAF was seconded to RAF Ventnor in 1942 and was involved with the early days of Gee. His son Larry tells us : "My father was not at the screens of the Gee, but helped develop it – and had a couple of interesting stories about a secret trip over the Channel at night to test it, and also how he and a buddy snuck off the US base when a raid was imminent, stealing the US CRT scope, to replace one at the British base that had been damaged by German bombs. They got it hooked up and working in time for the raid to take place- I guess the RAF colonel was on the phone a lot to them, asking how much longer, because the raid would have to be aborted if they weren’t operational in 20 minutes. My father said he told him it would be ready, but to get off the phone and let them work. Afterwards he said the Colonel told him he would like to put them in for a medal, but it would probably get them courts martialed by the US. " Larry has sent this very interesting Christmas dinner menu. 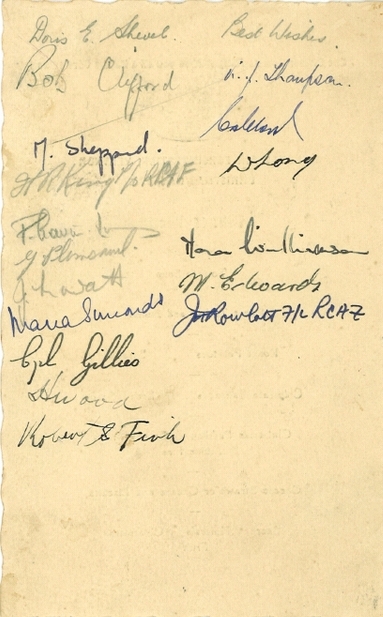 Amongst the signatures on the reverse is that of Flt.Lt Rowlatt the Canadian CO at that time. 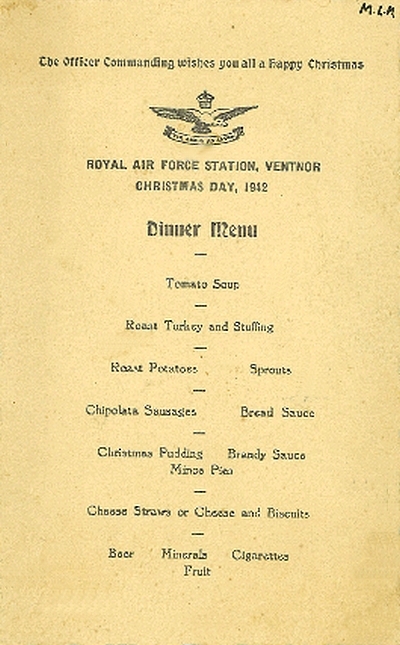 Presumably the dinner was held in the Crab & Lobster pub in Ventnor which at that time served as the Officers' Mess.